Rental properties across the Las Vegas Valley are offering more than just a pool and fitness center these days. They’re taking it up a notch by offering service-oriented amenities to attract residents and keep existing tenants happy. WestCorp Management Group’s more than 20 Southern Nevada properties offer amenities such as a weekly visit from a masseuse, free Starbucks coffee and a dog park. Emily McCann, vice president of marketing and education, said Dream at 1005 Wigwam Parkway in Henderson, offers a media lounge with a large projection screen, outside seating area with a television, barbecue areas, water bottle and towel service in its 24-hour fitness center and classes such as kettlebell and yoga. According to McCann, WestCorp surveys its residents on an annual basis in order to find out what kinds of amenities they’re interested in. McCann said there’s been a shift toward service-oriented amenities. In the future, McCann said WestCorp will continue to explore new service-based amenities. Downtown Summerlin’s residential development, Constellation, which is scheduled to start preleasing during the first quarter of this year, will offer residents an on-call masseuse, private poolside cabanas, game lounge, tanning salon, billiards, club room with bar, business center and 24-hour fitness center, among other amenities. Douglas Eisner, managing director at The Calida Group, Constellation’s joint venture developer with The Howard Hughes Corp., said the fact that the 124-unit, gated rental luxury development will surround Downtown Summerlin, the 1.6 million-square-foot shopping, restaurant and entertainment center, near the 215 Beltway and West Charleston Boulevard, is its greatest amenity. According to Eisner, the focus with the Constellation was on walkability. 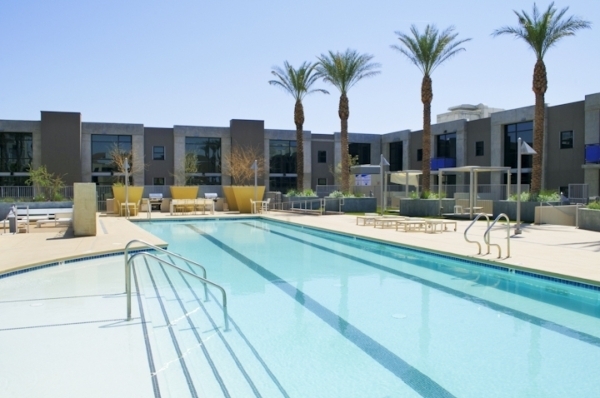 Downtown at Juhl apartments on East Bonneville Ave., residents have access to a resort style pool, hot tub, outdoor theater, rooftop deck that overlooks the Strip and the Las Vegas Valley as well as a concierge that greets their guests, accepts their packages and makes reservations. Uri Vaknin, a partner at DK Las Vegas LLC, the 341-unit building’s owner, said when the company purchased Juhl in 2013, it was only equipped with a pool and fitness center. Vaknin added that residents can take advantage of the building’s “In the Know” program, which operates like a membership service and offers discounts to tenants at area restaurants as well as access to events in order to bring residents together at establishments across Las Vegas. Some of Juhl’s additional amenities include a two-story fitness center, gated dog park, on-site dry cleaning and specials at the building’s ground-level restaurants and retailers.